This position is part-time (up to 25 hours) with an opportunity for growth into full-time permanent position. Pay ranges from ($9 – $11/Hr) DOE with possibilities for growth. Follow up on all responsibilities. You must be a very punctual person with excellent interpersonal skills. You get things done! You follow through on every task, no matter how big or small. You follow up on every task that is given to you to ensure that is done correctly and on-time. 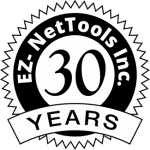 If you are looking to join a team that produces results, please contact EZ-NetTools at (208) 356-8361 ex. 2013 or email your resume and a portfolio to christine.eznettools@gmail.com.